For some time, a mysterious photo had been in circulation that depicted an event that had taken place quite obviously in Stonnall at some point. It is displayed in the lounge of the Old Swan and it was published in the Conservation Society's book, Discovering Stonnall. The photo tells a story in some way, but what exactly was it? If a story is to be understood, it must tell of the where, why, when, who and what of a particular sequence of events. Clearly, the photo had been taken outside the Royal Oak public house, so the where element of the photo's origin was in no way in doubt but, other than that, there was no apparent available explanation. The photo is shown below. The photo shows a gathering of people in Main Street outside the Royal Oak, the scene to the left having changed but little since the photo was taken. The public house is draped with bunting and more of it is suspended above the road. Two men, one of whom is wearing jodhpurs, are leading a decorated horse and a cart with two Union flags erected at the back. The cart appears to be carrying four girls, one of whom is sitting prominently facing the camera. Some men are standing outside the pub's door and to the right we see some people, apparently in fancy dress; there is a pushchair with what appears to be a female infant in it and somebody appears to be pushing what may be a handcart. In the middle distance to the left, we can see the barn of Lower Farm and to its right in the further distance we can see the blacksmith's forge. In the far distance, we can see the hedgerow of Cartersfield Lane with just one building visible. To the right, we can see the field formerly known as Wallong. With no background information to go on, we could only hazard a guess as to what was happening: some people had gathered for some kind of celebration, probably involving a procession, given the presence of the horse and cart. Dating the photo with any precision in the absence of any background information is virtually impossible. The Wallong field was built up in 1960, the forge was demolished in about 1954 and Cartersfield Lane was built up initially in 1937/38. It follows, therefore, that the photo was taken some time before then. And so things could have remained unexplained forever - but for the advantages of living in the Age of the Web. Occasionally, because the of History Group's web profile, things sometimes turn up unexpectedly out of the blue. So it was when I received an email and attachment from Isobel Dams a few years ago. She explained that her mother, Jean (née) Bower, at the time from New Barns Farm, Lower Stonnall, had been the carnival queen in Stonnall in the 1930s, at the age of 10. To my astonishment, when I opened the attachment, I found myself looking at a different photo of the same event as depicted above. This photo is shown below. This photo is a close-up of the cart and we can see clearly that there were four girls on it, with Jean taking pride of place as the carnival queen. To the right, we can see the curious handcart in greater detail: it appears to be a pram with a wooden, woven basket. Isobel went on to explain that the event had taken place on spring bank holiday, 1 June, 1936. Armed with this information, we were then able to search the Lichfield Mercury archive for more information. Sure enough in the first week of June 1936, the event had received a notice with several column inches of explanation and description, although no photo was published in that edition of the newspaper. On reading the Mercury's report, it transpired that the village's carnival committee had met in the Institute the previous day and had elected Jean to be the carnival queen. The three other girls were also mentioned by name: Florence 'Flo' Glover, Grace Spendlove and Irene Foden. The Mercury supplied some more information: Stonnall Carnival had been initiated the previous year in 1935. As we will see, the event that was intended to be an annual celebration in Stonnall turned out to be very short-lived. Anyway, now we had the names of all four girls and we could positively identify one of them. But as far as the three other girls were concerned, who was who exactly? We certainly had plenty of information about them: Grace is a life-long resident of Lynn, Irene belonged to the farming family of Gainsborough Farm and Flo had lived at Elm Cottage in Main Street for most of her life. Once again though, it seemed as if we might have reached a dead end. Flo and her sister, Audrey, had been taken in as children by Mr and Mrs Woods of Elm Cottage when their father, George 'Bottle' Glover, had become a widower prematurely. (George had a twin brother, James 'Cork' Glover, who died in a WWI incident, but that is another story.) Flo remained single, but Audrey married Albert Higgs in 1955. Eventually, George would move in and all four lived at Elm Cottage for the rest of their lives. Albert was the last to pass away, a few years previous to the time of writing. Following a decision at that point to clear the house prior to its sale, several fascinating photographs were discovered. 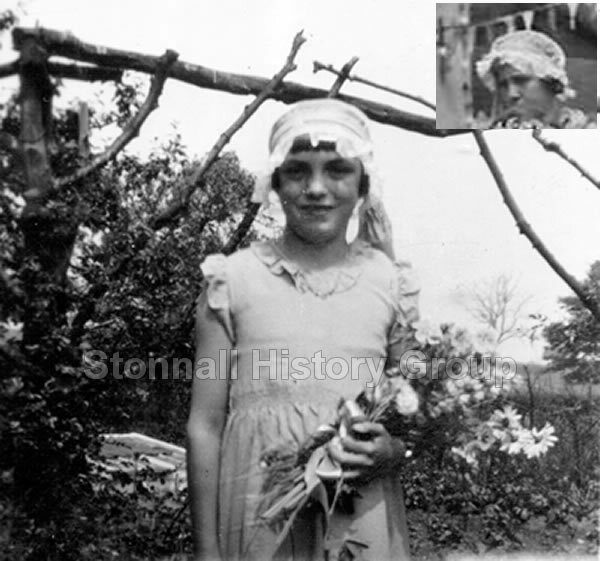 One of them, a photo of Flo as a young girl holding a bouquet and standing outside the cottage, seemed vaguely familiar. We then realised that this was because she was one of the girls in the Isobel Dams photo. The Elm Cottage photo of Flo is shown below with an inset from the Isobel Dams photo for comparison. Flo Glover standing in the front garden of Elm Cottage, 1 June, 1936. There can be no doubt that she is the girl in the Isobel Dams photo (inset). As to the identities of the remaining two girls, we are fairly certain that the one sitting to Jean's right in the Isobel Dams photo is Grace Spendlove, based on some other photographic evidence that we have. When I had first found out about the carnival, I began asking around some of the elderly Stonnall residents to find out what they could remember about it. Dot Smith, who was by then in her 90s, could remember attending one of the carnival events dressed up as a nurse, although she could not remember the year. I looked again at the first photo and I realised that the person dressed in white with a white headdress was in all probability the lady herself as a 13 year-old girl. Dot later agreed with this deduction when shown the photo once again. She also stated that the girl standing next to her was Cathy Craddock of Cartersfield Lane. There is a better view of Cathy in the second photo. I then suggested that Mr Pearson, the Stonnall School teacher, might be in the photo and we agreed that he is the person standing to the right in the first photo. Incidentally, Dot tells of her experience as a Second World War GI bride in this story. The Lichfield Mercury report indicates the identities of the couple with the customised pram and pushchair. We believe that they are Joe and Agnes (nee Hopley) Ensor and that the infant is their son, Joe. Agnes was one of the figures in the Royal Oak Photo as a young girl. This means that after an intervening period of over 80 years, we have managed to identify most of the people standing to the right and all of the girls in the cart. Not a bad result. 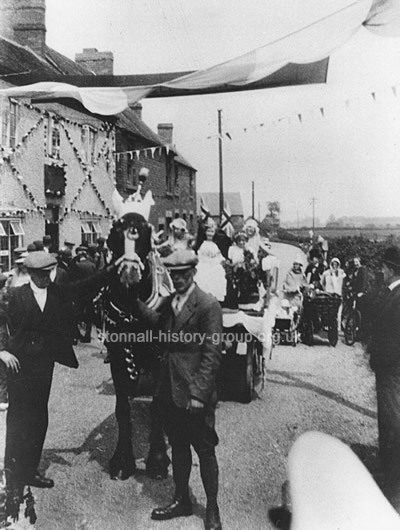 "Stonnall Carnival was an annual event which assembled outside the Royal Oak. "Local farmers supplied the horse-drawn carts which were presented in immaculate condition for the floats. "The event that sticks out in my memory was I think about 1937 when two of my schoolfriends and I decided we would like to attend the event in fancy dress. One decided to go as an elf, the other a drummer boy and I remember my mother taking me to a fancy dress shop in Walsall to get a Red Indian outfit. 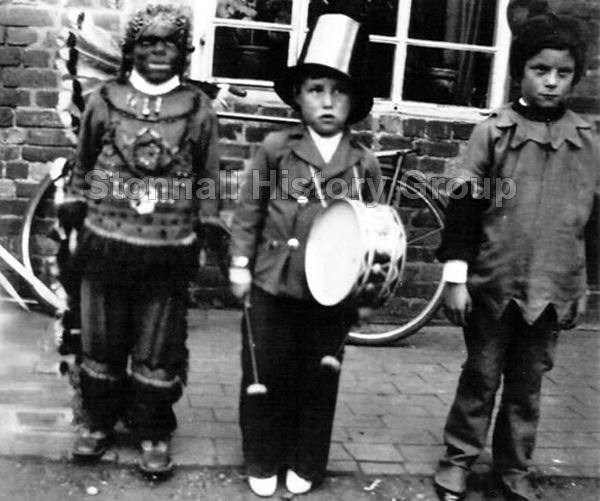 Gordon, left, as a Red Indian, with two friends just before the 1936 carnival. "Almost everyone from the village was involved either in groups or individually. The Women's Institute was one of the groups involved. "We started off up Main Street to the Chester Road then turned left. There was no other traffic on the road. It's hard to believe that now. We turned left into Gravelly Lane and then left into Church Road and on at Church Lane towards the school, where we turned left into Main Street. We continued through the village to the Stockhold field where all sorts of activities were set up. "I do not know who organised this event but have always assumed that some sort of committee must have done." Gordon gives a detailed account of his early life in Old Stonnall in this story. 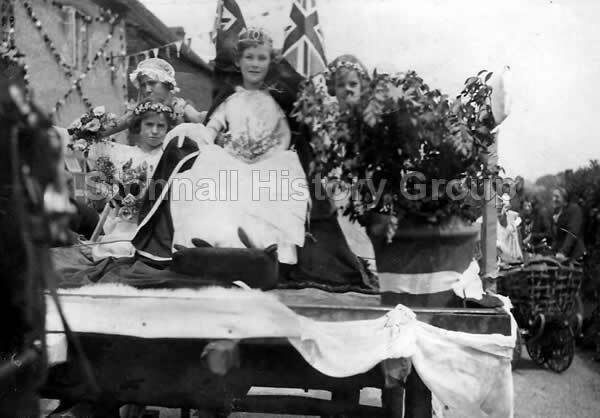 It is known from contemporary newspaper records that Stonnall Carnival began as an annual event in the village in 1935. The festival continued for the next four years but ceased after 1939 because of the Second World War and never recommenced after that conflict concluded. The carnival seems to have shared some characteristics with the old Stonnall Wake, which is known from several independent sources to have been celebrated in the village annually. A reference in an early 19th century edition of White's Directory states that the Wake took place in Stonnall on the first Sunday following St Peter's Day (June 29). 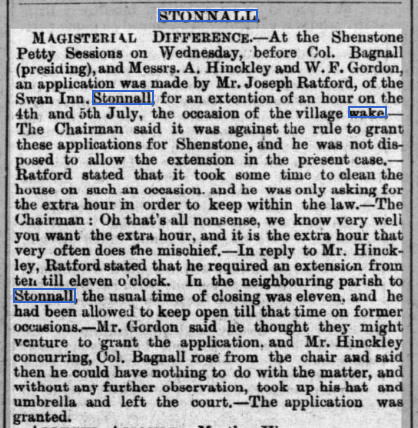 This information is confirmed by a Lichfield Mercury report of June 1880 in which the licensee of the Swan Inn, Mr Joseph Ratford, is stated to have applied to the magistrates for a one-hour extension to his licence for Sunday the 4th and Monday the 5th of July of that year on the occasion of the Wake. Incidentally, the extension was granted, but only after some major dissension among their worships, with one of them, Colonel Bagnall, storming out of the court. The 18th century local historian, Rev Henry Sanders, stated that every year Stonnall parishioners would examine their bounds, starting with scripture readings at the village's stone cross. Rev Sanders' statement is clearly a reference to the rituals known as beating the bounds, which were annual local processions commonly practiced throughout Britain and elsewhere in Europe. Their origin is not fully understood, but it is probable that they were Christianised practices that had their foundation in pagan ritual. The fundamental function of these rituals was the blessing of a community's farming activities during a procession around that community's boundaries - hence beating the bounds. Stonnall Wake ceased to be observed at an unknown date. Its demise may have been the result of the standardisation of bank holidays in the late 19th century. However, its last ocurrence was almost certainly still within living memory in 1935 and a, perhaps elderly, informant may have given information about the assembly's start point and its processional route to the organisers of the new carnival. Gordon was not quite right about the year of his involvement in the carnival. In fact, he took part in 1936. We know this because of his description of the route of the procession. In 1937 the procession took on a very ambitious circuit that included Muckley Corner, whereas he describes a simple circuit around the boundaries of Upper Stonnall. Returning for a moment to the first photo shown above, we were eventually able to identify the man in the centre at the front. His name was Richard Southall. He had served with a mounted regiment in the First World War and was clearly a horse specialist. Later, he worked as an ostler at the colliery in Walsall Wood and also at Sandhills Farm for the Lane family. We can speculate that the horse and cart had come from Lane's farm. We have another photo of Mr Southall taking part in a carnival in Walsalll Wood. One or two elderly Stonnall residents worked with his daughter at Hill Bros in Shenstone in the 1950s.